Need to pick up the pace…? Give me more power then! Buoyed by my 3.5lb weight loss in the past week through my new diet and training regime (specifically for the BRKC event in January), I turned up at the track in Eastleigh in a positive frame of mind. This was improved (despite the ~40 minute delay due to overrunning sessions throughout the day) by the banter I now enjoy with the “regulars”. There were, however, some members in this event that I had not raced before, putting a question mark over where I thought I would finish at the end of the evening. During the briefing, the format was clarified; F1-style qualifying (three rounds with the slowest drivers knocked out at the end of each round), race one (20 minute race, one enforced pit stop, with the starting grid as per qualifying), and race two (20 minute race, another enforced pit stop, but with a reversed grid from qualifying positions). The points would be handed out in the same style as F1 and any tied places would be decided by lap times. Also during the briefing, we had our karts randomly selected for the evening; your name was called out and then the kart number you had been assigned; just to be clear, I have no problem with this way of selecting the karts, it gives everyone an equal chance of getting a good kart or a bad kart and is the only fair way of dealing with the situation. Ideally, there would be minimal differences between the karts, but when the marshal laughs when your kart is drawn out of the pot and states “Haha, you don’t want that one!”, maybe there’s a feeling that this particular kart isn’t the best. Anyway, I hoped it was “psychological” and that I could drive the kart as well as I could and end up somewhere in midfield. I also thought that I would have an advantage over the others, having raced the the BRKC earlier this year and knowing where I had made mistakes in pit stops there. I was all too aware that with eleven karts on track, qualifying could come down to leaving enough space between yourself and the drivers in front (the haunting memory of me being the slowest driver and compromising another driver’s qualifying in my first ever BRKC heat ran through my mind again). The kart didn’t feel too bad in the opening laps, but there was a distinct lack of acceleration at any point; I consistently put my foot to the floor and there was a big delay between this and getting any forward movement – something that would come to cause me some discomfort in the race. I thought that I would easily make it through to the second qualifying stage before I got into the kart, whilst I was in the kart, I thought I would scrape into Q2 (I only needed to avoid being in the bottom three), but when I got out of the kart and it was announced that I was dead last, I knew something was wrong. Looking at the times of everyone in the session, I was really disappointed that, with a best of 25.727s, I was about half a second off the pace I was expecting. I stood around on my own, whilst the other sessions continued, thinking about what could have been. I was determined that I could climb back up the field as I had done to a certain extent in the top gun event at the start of this month. After all, I was racing some of the same drivers and I managed it then! It turns out that I couldn’t in kart 24. The race was just painful; both mentally and physically, including some incidents where drivers were expecting me to accelerate away, but due to the kart’s performance, I was just a mobile chicane in the acceleration stage out of corners. There were several violent bumps from behind; on one occasion, my head jolted back so hard that I was looking at the roof of the building for a second. Strangely, due to the nature of the pit stops, I actually led this race for a lap, before falling to fourth before my pit stop and then to last place immediately after it. After the first race, the race director called me over and asked me if there was something wrong with the kart, I believe my response to him was “Yes, it’s s****!”. I did go into more detail, saying that there was no power coming out of the corners and no acceleration going up the bridge. I don’t like to blame the kart (I see this as the risk you run racing rental karts) but when your best time after 30 minutes of racing is over half a second slower than the guys in front of you, you start to get disheartened. Whilst we were told that there would be no kart swapping, the race director told me that my kart was a joke and that I could swap with kart 14. 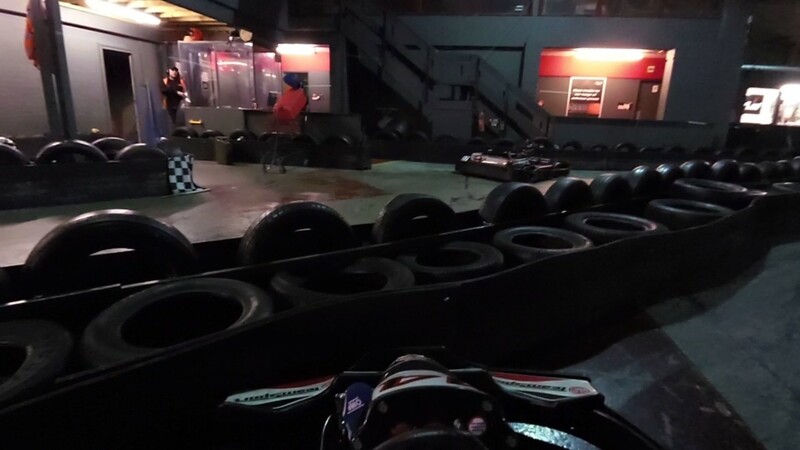 Now this was a double-edged sword; undoubtedly, kart 14 would be better than kart 24, but having sat there for 40 minutes without moving or even having its engine run, I would now be a sitting duck in the first few laps for everyone behind to pick off with their lovely warm karts. I took the swap anyway and proceeded to the grid (a grid that due to my previous karts failings, meant that I was now on pole position!). I got a good start, but unlike the BRKC, you were able to pit on the first lap, so I soon got caught up with the traffic coming out of the pits, but a lap down on me. Surprisingly, and unbeknown to me, I actually led the race for a number of laps whilst waiting for my opportunity to pit. I saw the yellow light come on and I dove into the pits for my mandatory stop. I came back out into 7th position, where I quickly made it up into 6th and stayed there for 3 laps. As much as I tried to be patient, I went slightly hot into the large hairpin corner and spun around and, in my attempt to turn myself round the right way, found myself in the tyres on the outside, resulting in me dropping down into 9th place. Finally, I managed to regain one more place, which I maintained until the finish, despite my attacks on the driver in 7th place. My fastest lap of this race was a respectable 24.830 seconds (almost a second quicker than I had managed all evening! ), making it even clearer to me and the other drivers that it was the kart to blame in the first half of this event. I would love to do this format again, but hopefully next time, there will be more of a level playing field!